Welcome to some weekend fun and entertainment with drones. We spend a lot of time scouring the web for news, information and more on all the great drones around the globe. In our travels, we encounter some fun and funny stuff, and we want to start sharing that with you. Today we will be taking a look at cinema grade drones. Next up in our series, let’s explore some fun with drones equipped with cinema cameras that record in 8K or greater glory. This video from Phil Holland shows off one of the most powerful and somewhat overkill aerial video setups available to-date. 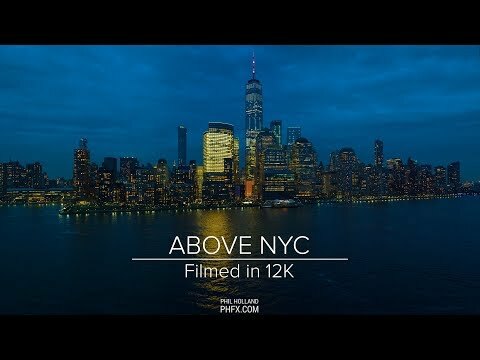 This video, while uploaded to YouTube in 8K glory, was filmed using the RED Weapon Monstro 8K camera. A machine that shoots at over 100 megapixels. A wonderful view of New York City. This video comes from Source Films, also using RED Weapon Monstro 8K camera, they produce an amazing video to watch. Following a mountain biker through the hills of SoCal along with some great cinematic shots of the landscape makes for a perfect drone video.